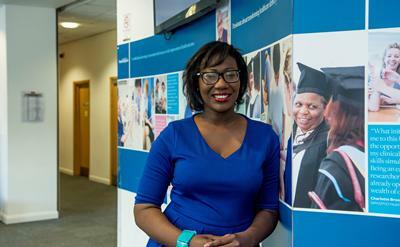 A recent University of Southampton graduate has received a prestigious international honour for her work promoting family planning and reproductive health. Dr Kizanne James was announced as one of the 2017 winners of 120 Under 40: The New Generation of Family Planning Leaders by The Bill & Melinda Gates Institute for Population and Reproductive Health at the John Hopkins Bloomberg School of Public Health (part of John Hopkins University in Baltimore, USA). Kizanne, a medical doctor from Trinidad and Tobago who graduated from the University’s MSc Leadership and Management in Health and Social Care course this summer, is one of 40 young people worldwide to be honoured following a public vote. She has been promoting family planning since she was at medical school through activities including voluntary talks on sexual health at institutions including prisons, and developing a phone app and website giving information about contraception. In 2016 she was chosen to become a World Contraception Day Ambassador, and earlier this year won a Women in Science Engineering and Technology (WiSET) award. Kizanne said: “I feel really honoured and excited to have won this award – it means so much to my work in sexual and reproductive health in the Caribbean. “It was an extremely competitive process, I was up against experts from all over the world. The process began with online voting, with only participants who received a certain number of votes making it to the selection panel of family planning specialists. Kizanne will receive a $1,000 prize from the Gates Institute to continue her work in family planning, and will be among a representative group of winners attending special celebrations in the USA at the end of the month and to collect her award. The trip will include meetings with leaders in the field, training to enhance her skills and expand her networks. Kizanne has also been invited to speak at the event. Kizanne’s supervisor at the University, Dr Dawn-Marie Walker, Associate Professor in Health Sciences, commented: “Kizanne is exceptionally talented, she has been a great inspiration to other students in the Leadership and Management programme, and we are very happy that she came to Southampton to study with us. “She has been exemplary in supporting the faculty in Equality, Diversity and Inclusivity initiatives through being an ED&I committee member. Furthermore, she has been an excellent role model for women in the university after winning a Women in Science, Engineering and Technology award 2017."